Habitat for Humanity is one of the most trusted names in the world. Each independent affiliate of the international non-profit is seeking to provide decent and affordable housing to hard-working individuals and families. Homeownership is made possible through non-profit, zero-interest mortgages to families that could not own a home through conventional loans. It is easy for affiliates to see first-hand, the impact of homeownership on someones life. Thanks to Habitat Georgia, a study was performed by Georgia Tech’s Center for Economic Development Research (CEDR) to better show how Habitat is affecting the homeowners and the communities in Georgia. 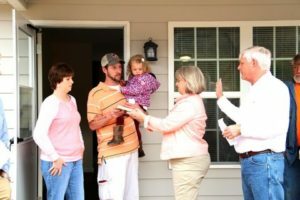 The survey took place in September of 2016 and involved calling on hundreds of current Habitat homeowners in the state of Georgia. The questions ranged from financial stability, to community involvement and education. The goal was to attach factual numbers to what we already knew, Habitat homes are vehicles to a better life. Before becoming a Habitat homeowner, most participants rely on some form of public or government assistance. The recent study showed that Habitat homeowners as a group reported a decrease in use of nearly all public assistance programs since moving into their homes. Government funded food assistance and healthcare were the two most widely used forms of public assistance. While nearly all areas showed decreases, these two reflected the largest percentage point decrease in usage when comparing pre-purchase and post purchase of a Habitat home. Almost sixty percent of the participants reported that they have either “much more money” or “a little more money” since becoming a Habitat homeowner. This number solidifies the usefulness of incorporating financial education and a stable home. In addition, 74% of homeowners are better able to save money since purchasing their Habitat home. The impact of affordable housing has lasting effects. One of the most important measurements is the effect that a stable home life has on education. Most of the time we think education only refers to our children, but this study addressed adult education as well. Forty‐three percent of adult survey respondents have started or completed higher education or training programs since becoming a Habitat homeowner. Fifty‐eight percent of the survey respondents indicated that other adults living with them started or completed an educational or training program since moving into their Habitat home. Community or technical college was the most frequently selected program, followed by a 4‐year college or university. In Jackson County where adult education is so critical, these numbers cannot be ignored. Creating stability is not only good for the kids involved, but the parents and guardians as well. According to respondents with children in school before and after Habitat homeownership, 42 percent said that their children’s grades were “excellent” before moving into their Habitat home. After moving into their Habitat home, the percentage of respondents rating their children’s grades as “excellent” increased to 55 percent. Sixty‐six percent of homeowners said their feelings about themselves have changed since becoming a Habitat homeowner. The survey prompted those who have changed the way they feel about themselves to describe how their feelings have changed. Responses were synthesized into broad themes. 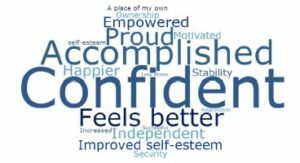 The word cloud below illustrates the frequency of responses by those Habitat homeowners who feel differently about themselves. Respondents most commonly said they feel more confident (17 percent) and accomplished (11 percent). Habitat homeowners shared an example of how being a Habitat partner family affected their lives and the lives of their family members. 76% reported that their lives are better now that they are in a Habitat home. The results from this study go to show that the Habitat model is working to strengthen and uplift individuals and families. We owe a huge thank you to our volunteers, sponsors, staff, board of directors, and most importantly the homeowners. As a hand-up organization, it is the responsibility of the homeowner to make the most of these resources and their situation. This goes to show that they are making that effort and proves that opportunity and hope go a long way in changing someones life. Want to make an impact every month?? Try our monthly giving program and become a member of the Hope Builders Club.